The new generation of U21 (for players born after 1998) kicked off with a 1:1 away draw in their first friendly match, against Azerbaijan. 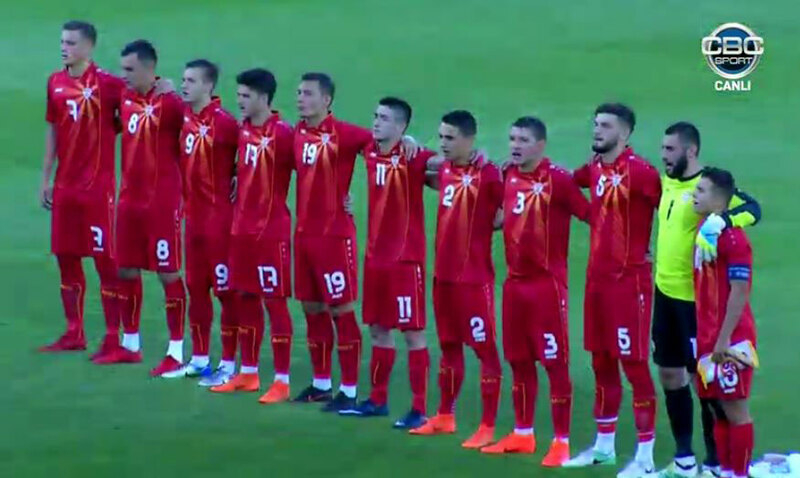 In the first of the two encounters against Azerbaijan, Macedonia played a draw in a game where each side dominated one halftime. This was the first test for the players from the new generation, born as of 1998, that will compete in the next qualifications. The team was lead by the temporary coaches Zvonko Zlatanovski and Dobrinko Ilievski who were chosen to replace Blagoja Milevski for these two games, since Milevski is leaving his position as U21 coach by the end of the month. Macedonia started the game with the typical 4-2-3-1 formation, with Davor Zdravkovski as new captain and leader of the new generation. However, the game didn’t start well for the Macedonian team as Azerbaijan took the lead after only 5 minutes of playtime, through a goal by Əliyev. Azerbaijan carried on to control the game throughout the entire first half, leaving Macedonia very little action up front. The only decent chance came near the end of the halftime, when Milan Ristovski started a good action but he failed to do the finish after Trapanovski assisted back to him for the final shot. The second half continued the same but things changed drastically after the first substitutes. The Macedonian coach made 3 changes after the hour mark and brought in Churlinov, Ferukoski and Jovanov on the places of Trapanovski, Milovanovikj and Todoroski. This change seemed to completely change the team as Macedonia suddenly became much more active and dangerous in the offense. After numerous chances created through Churlinov, Ferukoski, Sadiki and Manevski, in the end it was the centеr back Trajanovski who scored an equaliзer in the 87th minute, after a free kick delivered by Zdravkovski. In the end, the final 1:1 result seemed to be a right outcome of the game where both teams showed even performances. The same teams will meet once again 3 days later, for a second counterpart. Azerbaijan: 12. Kamran İbrahimov; 3. Anton Krivotsyuk, 13. Murad Qayalı (26. Faiq Hacıyev, 87), 6. Hacıağa Hacılı (C) (21. Rüstəm Nuriyev, 90), 2. Amin Seydiyev, 18. Ricat Qarayev, 10. İsmayıl İbrahimli (28. Şakir Seyidov, 75), 23. Ziya Əzizov (11. Süleyman Əhmədov, 69), 7. Fərid Nəbiyev, 20. Kamran Əliyev (19. Famil Camalov, 69), 17. Ozan Can Kökcü. Macedonia: 1. Risto Jankov; 3. Mihail Manevski, 19. Filip Trajanovski, 5. Nehar Sadiki, 2. Todor Todoroski (18. Vane Jovanov); 10. Davor Zdravkovski (C), 8. Jani Atanasov (77′ 4. Mile Todorov); 9. Kristijan Trapanovski (14. Darko Churlinov), 11. Omar Imeri (81′ 21. Kristijan Trajcheski), 17. Daniel Milovanovikj (16. Marko Ferukoski); 7. Milan Ristovski (90′ 6. Stefan Bogdanovski).